Are you happy with your form conversions? You spend a lot of time and money to bring people to your business website, but you feel that NOT ENOUGH people are filling out your forms. You realize that you’re leaving money on the table, and it’s frustrating the heck out of you … but you’re not sure what to do. This is extremely demoralizing because nobody likes losing money. You see, the biggest reason why people abandon your website without filling out your form is distraction! Majority of web pages contain multiple offers which distract users and take them away from the most important part, your lead generation forms. That’s why today, we’re introducing Form Pages for WPForms – the first “distraction free” form landing page solution in WordPress. Form Pages allow you to quickly create dedicated form landing pages without hiring a developer or writing any code (in literally less than 5 minutes). The biggest challenge with WordPress forms until now has been that all form layouts are controlled by WordPress themes, and most themes simply don’t prioritize form layouts. And worst, a lot of them lack the ability to create custom landing pages. 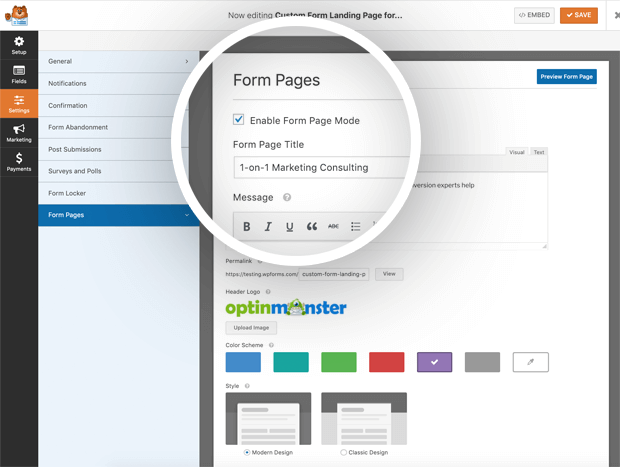 With Form Pages, you can instantly create a custom landing page for any of your WordPress forms by simply enabling the Form Page Mode from your Form Settings. You can add your logo, choose from two different high-converting form styles, pick a color scheme and that’s it. Your distraction-free custom form landing page is ready to be shared. Lead Generation: Make subscribing to your email list super simple for users by creating a webpage dedicated solely to signing up. Surveys: Whether it be a survey to gauge customer loyalty, an employee satisfaction survey, or an event feedback form to help your party planning business, having a webpage to direct users to is simple and easy. Membership Sites: Create a form landing web page on your site with user registration and login forms, making it easier on people to sign up and login to your site. Events: If you need people to RSVP to an upcoming event, whether it be a business conference or a child’s birthday party, add your invitation and RSVP forms to webpages and invite people to reply. 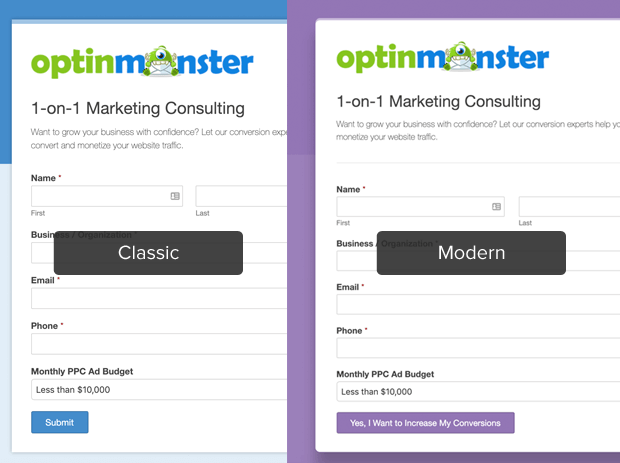 We took the pain out of creating form landing pages and made it easy. Give Form Pages a try, and let us know what you think. P.S. Don’t have the WPForms Pro license? Click here to get WPForms Pro and see why over 1 million website owners trust WPForms to create their online forms. I wish that you could easily customize your forms…like being able to center the button in the forms. ..or being able to add two fields in the same row, side by side. Sure, you can definitely customize your form to better fit what you have in mind! To start, I’d recommend following our guide to set up a multi-column layout. That will let you place fields side by side, and also let the rest of the form appear even with the message box. In case it helps, here’s WPBeginner’s tutorial on how to add CSS like this to your site. I hope this helps! If you have additional questions, please get in touch with our support team. How do I add a 20% Discount Coupon? I agree with Alex. WP Forms is great and easy to use, but a bit more built-in control over layout for non-programmers would really make this plugin the best in class. MySQL direct integration plugin to wpforms would make this a must have form. Everything else is simply great.